With the general availability of electricity, the second industrial revolution was launched with the design and implementation of assembly line production processes. The implementation of these assembly lines streamlined production processes and facilitated the mass production of goods with little customization. This led to a price reduction of such goods and an increase in output, productivity, and product availability. Gone were the days of individual custom design, and a new era of mass consumerism was born. In 1911, Frederick Winslow Taylor introduced his new book The Principles of Scientific Management (Taylor, 1997). In it he laid the groundwork of developing manufacturing processes that were built on scientific research and would greatly improve productivity. He thus created a new management discipline called scientific management. Many others followed this discipline from a value chain perspective, from an organizational behavior perspective, and from an organizational structure perspective. The third revolution came with the introduction of process automation through computerization. Computer technologies enabled the automation of business processes; and this automation could now be applied not only to production processes but also to the supporting processes. Automated process design now moved from the production floor to the office and forced the rethinking and redesign of existing organizational structures and organizational behavior paradigms. Management practices were changing again and starting to include strategic planning, leadership styles, and motivational concerns for employees. These new concepts were all based on extensive research that was done by scholars in the field of business practices and management disciplines. Even though bitcoin had a slow start, its popularity and value accelerated in 2017. There is a lot of discussion on whether the currency will prevail and become mainstream or whether it is just a bubble that will eventually disappear. The focus of this paper is not on bitcoin’s impact on business or its potential in becoming a world currency, but rather on the underlying blockchain technology that will have a revolutionary impact on the global economy and every business and government agency. 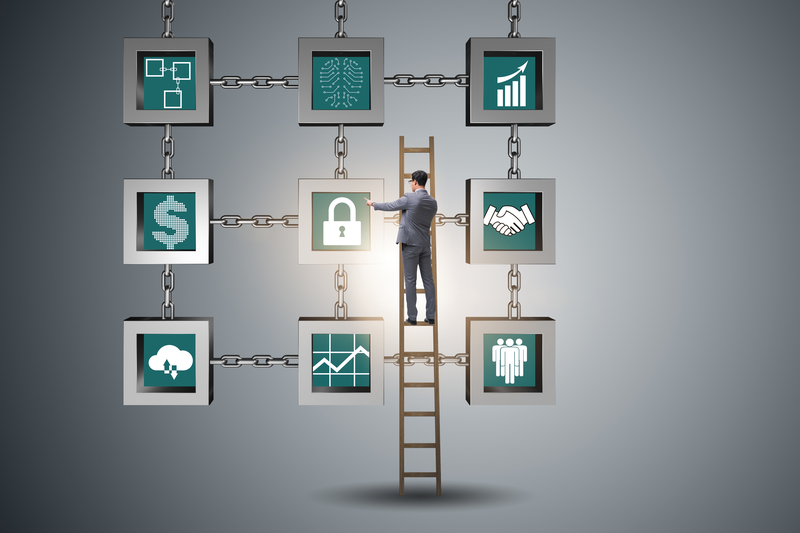 The blockchain is a cryptographically secure shared data layer that enterprises and governments can use to digitally track the ownership of assets across trust boundaries, opening up new opportunities for cross-organizational collaboration and imaginative new business models (Iansiti & Lakhani, 2017). Verified blocks cannot be changed and therefore can be trusted by all parties as authentic. These new smart ledgers will provide a single source of truth. Various transactions can be stored in these ledgers. Therefore, the potential is revolutionary for transactions not only between companies but also between business partners and governments. The current three-way supply chain verification process of invoices, purchase orders, and goods receipt could potentially disappear and would need to be redesigned using blockchain technologies that would incorporate smart contracts to monitor, enforce, and validate supply chain transactions between business partners. Not only that, but smart devices will interact with these contracts by placing orders directly or initiating preventive maintenance services. Artificial intelligence will use this data to gain insight into decision-making and blockchain transactions. Use cases that today require multiple layers of verification and validation will be simplified or completely eliminated and therefore generate significant cost savings. There is definitely agreement that blockchains (Owyang & Szymanski, 2017) will impact every fiber of business and will revolutionize the way business is done in many ways not even imaginable today. These are only examples that will have a direct impact on process design. However, a much larger research domain is opening up about how these technologies will impact organizational behavior models and organizational structures. What new management styles need to be developed that will facilitate these new technological developments? Will there need to be new strategy development methodologies put in place to enable this enormous digital transformation? What change management techniques should be developed to aid in the transformation and adoption process? What impact will this have on motivational theories and the management of employees? Today, business management is standing at the infancy of these described developments and has not taken significant steps to align with them. However, major software vendors such as SAP, IBM, and Microsoft (Shaw, 2017) are feverishly working on integrating their software and platforms with blockchains. It is not a question of if it is going to happen, but more a question of when. Therefore, these technological developments must be considered in strategic planning initiatives both for IT and the business. Collaboration models within industries need to be designed to take advantage of blockchains in order to stay competitive. The same holds true for research institutions and universities. Significant research will be required in various domains to develop new transformation methodologies, provide guidance to management practices, propose new organizational models, and assist in designing processes and collaboration methods to facilitate the transformation to these new technologies. These collaboration methods will also spearhead the transition so that all levels of management from various industries can use this research as guidance in transforming to this new and revolutionary technological paradigm. Research on all levels of graduate studies and disciplines will play a critical role in providing new discoveries, presenting new solutions, and confirming the validity and effectiveness of various approaches. It is interesting to observe that every industrial revolution to date has required significant research in management sciences, business process design, and organizational strategy and behavior. This will also be the case with Industry 4.0. To stay relevant in the transformation of Industry 4.0, universities’ technology and business faculties need to endorse these business transformations and consistently engage in leading-edge research in order to position themselves as vital contributors in helping industries and businesses maintain competitiveness in this tightly connected new world. Antonopoulos, A. M. (2014). Mastering bitcoin: Unlocking digital cryptocurrencies. Sebastopol, CA: O’Reilly Media Inc.
 Iansiti, M., & Lakhani, K. (2017). The truth about blockchain. Harvard Business Review, 95(1), 118–127. Taylor, F. W. (1997 ed.). The principles of scientific management. Dover. © 2019 InfoPrag inc. All rights reserved.